We left Eagle River behind and headed the 225 miles north on the Parks Highway to Denali National Park. 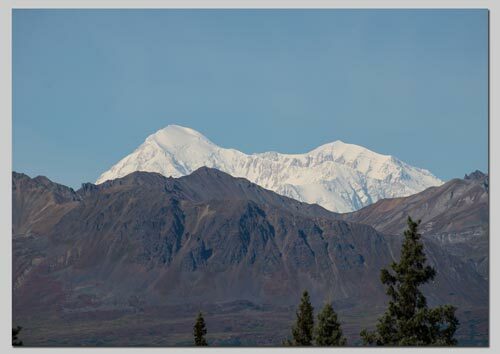 We had great views along the way of Denali (formerly known as Mount McKinley until the Presidents visit a few days prior to this), the highest mountain peak in North America, with a summit elevation of 20,310 feet (6,190 m) above sea level. An early morning start as we took the Denali park transportation bus to Toklat, 56 miles into the park, of which only the first 14 are paved. We crossed riverbeds, taiga and tundra and had many stops for 'photo opportunities'. 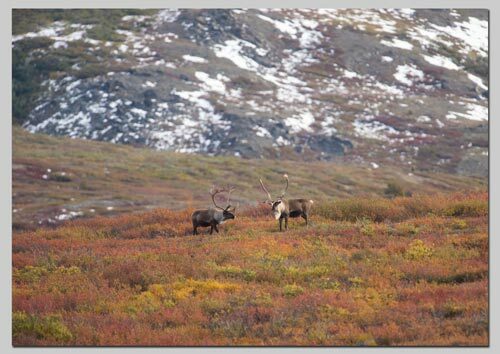 There had been snow just a few days before and all the peaks were white whilst the tundra vegetation was a mix of reds, oranges and yellows. 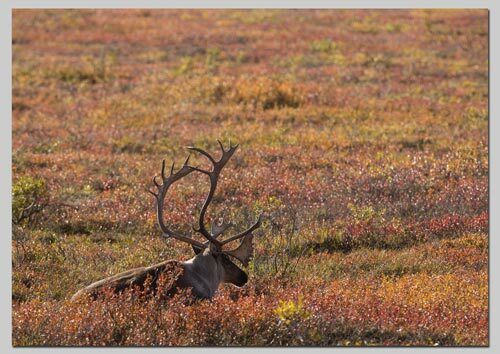 We watched Grizzly bears from a distance, caribou close up and moose as they crossed the road in front of us. Leaving Denali we continued north toward Fairbanks, a distance of 130 miles and through some amazing scenery. Mountains are in every direction and the fall colours got better as we got farther north. 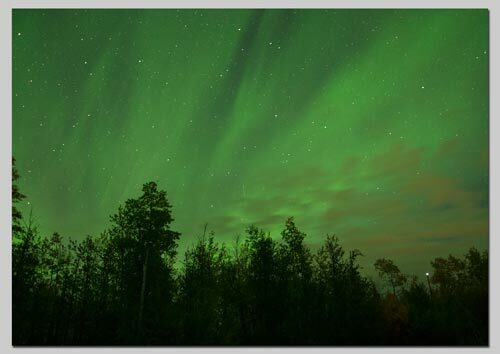 When we arrived we booked into the Tanana Valley Campsite which is on Aurora Drive and I was hoping that this place would give us a good chance of seeing the Northern Lights. 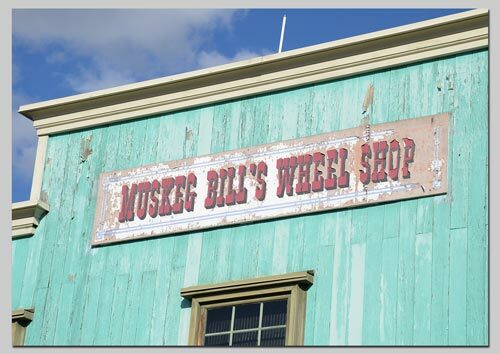 In beautiful warm sunshine we toured the Pioneer Park Historical Centre in Fairbanks where many of the original cabins and stores had been preserved and opened for viewing. Leaving Fairbanks we headed south toward Denali once again. Linda was driving whilst I enjoyed the scenery! We decided to break our journey with a quiet day at a super little riverside campground in the sleepy town of Anderson. Creekside campground was deserted for most of the day with only 2 more vehicles arriving late in the day. 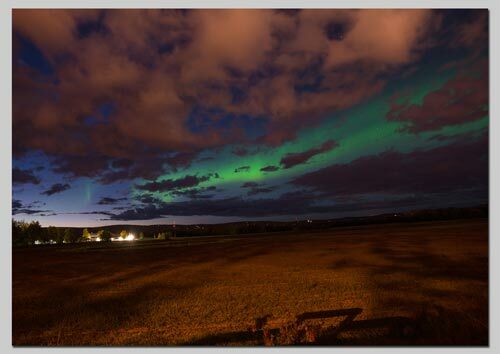 Once again the aurora was active although it seemed to look much better on the camera than in real life. Arrived back down at Denali National Park for a couple of nights to take in some more of the stunning landscapes and large mammals. 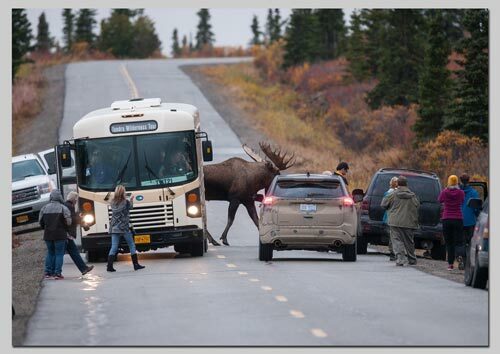 Late on a dull & wet evening, this Bull Moose caused a jam on the road into Denali. Leaving a rather wet Denali we travelled back along the Parks Highway as far as Talkeetna where we had a look around the rather quirky little town and enjoyed lunch in a local restaurant. 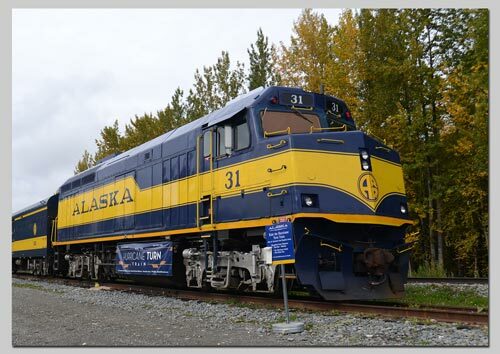 We are familiar with the town from watching the TV documentary about the Alaska State Railroad and we found one of their trains stopped in the town... not at the railroad station! 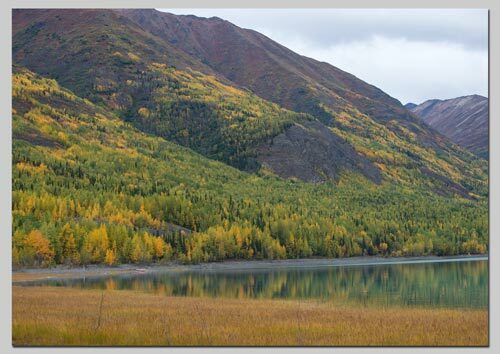 With a lot of miles under our belts we checked into Eklutna Lake campground just 26 miles north of Anchorage. It was rather rainy but the colours in the leaves and the wonderful views on the lake made it a very beautiful place.